As you may or may not know, DJ Hideo, a very influential DJ to me, has been diagnosed with colon cancer. You can read more at his website: www.djhideo.com. One day, I saw a post on his website for some custom slipmats. I thought, "meh, I don't need another pair". But when I saw that part of the proceeds go towards his fund, I didn't hesitate to get it. 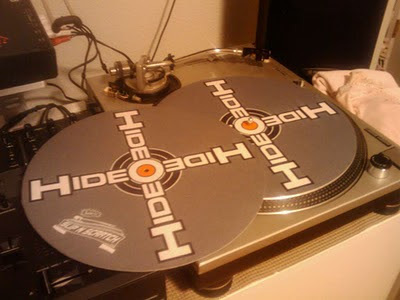 Here's the link to the post on his website: Hideo Slipmats. You can mix and match designs if you'd like. I opted to get a matching pair. A pair of mats came to about $35 with tax and shipping which I didn't mind if I was helping out, even just a little. When I received them, I didn't expect much. But, as soon as I tried them on, I was surprised. The mats feel like they're butter rugs, but with more cushion. If that's not smooth enough, the package comes with 2 wax mats to give you a more slippery feel. I thought that I would just keep these mats on ice, but I like them so much that I have been using them on my practice gear since I got them. Get well Hideo! God Bless!